EMA-gination: Want to See a Grown Woman Cry? I watched a video for the instructions to this triple easel card. I probably should have looked through some pins on Pinterest as well but I didn't think of that till I was done... and had cried a bucket of tears. 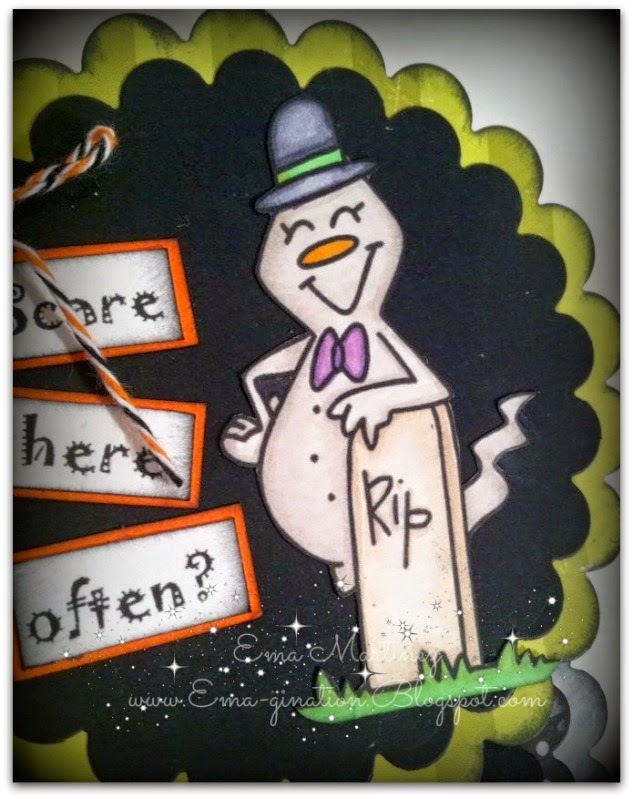 Super fun image is Goofy Ghost - Tombstone from Bugaboo. I've colored the image with Copic markers and did a fussy cut on it. All patterned paper is from The Angel Company, retired. I printed the sentiment from Word on the computer and cut it into rectangles to add some interest to the sentiment. 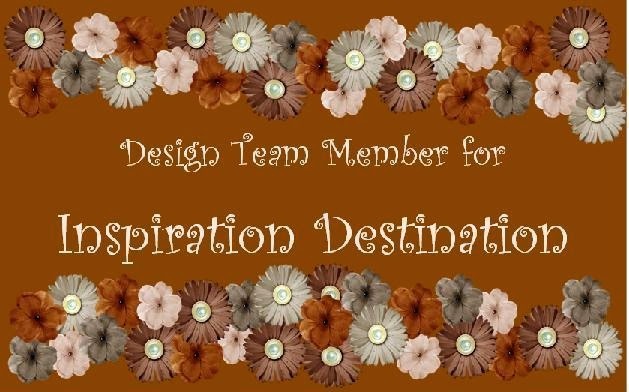 I used a Spellbinders Classic Scalloped Circles SM die for the shape of the card. 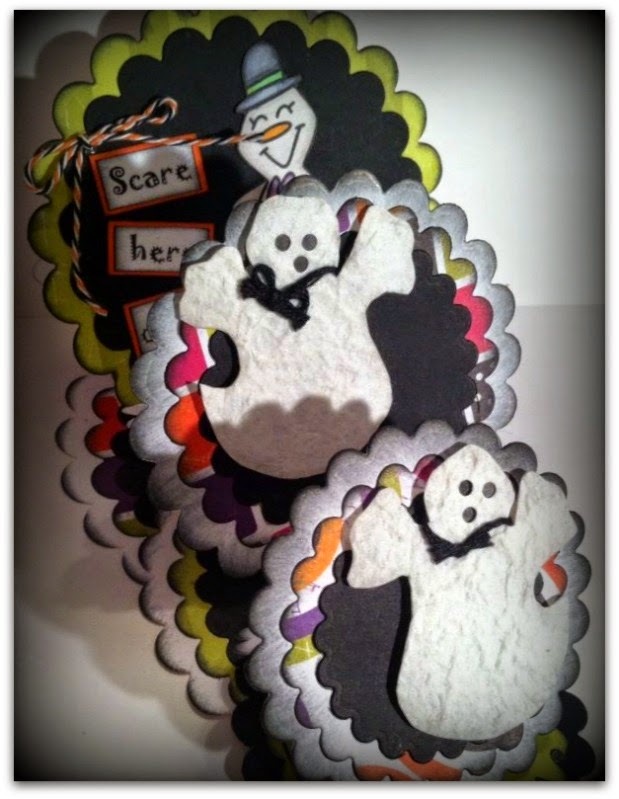 The Halloween-colored twine is WhiskerGraphics Divine Twine. 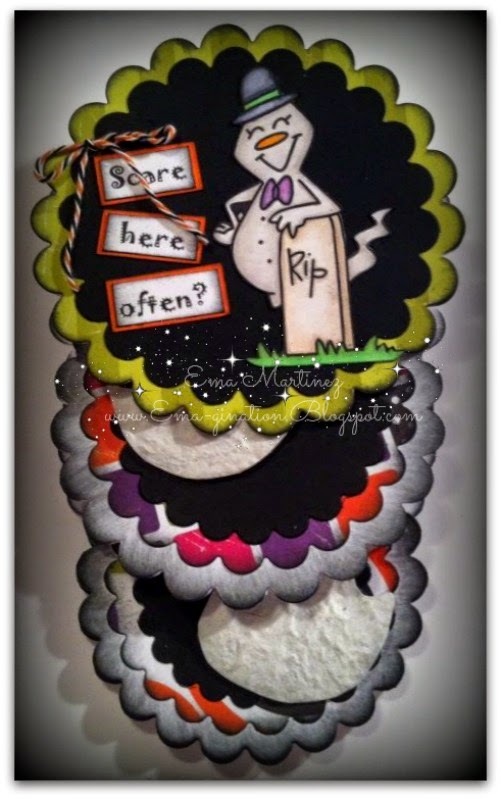 Plain card stock is from my stash and I used Tim Holtz Distressed Inks in Black Soot to ink the edges of the papers. 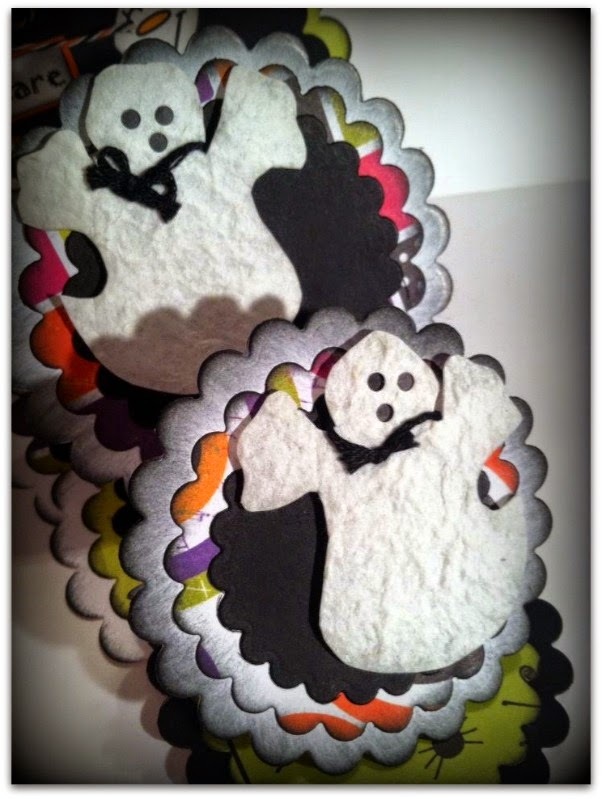 I made the two little ghosts out of mulberry paper, used an eyelet setter to punch out the holes for the mouth and eyes, backed it with a scrap of black card stock and tied black embroidery floss around the neck. The shape of the image is from a pattern in ABC Paper Piecing by Hot Off the Press, Inc. 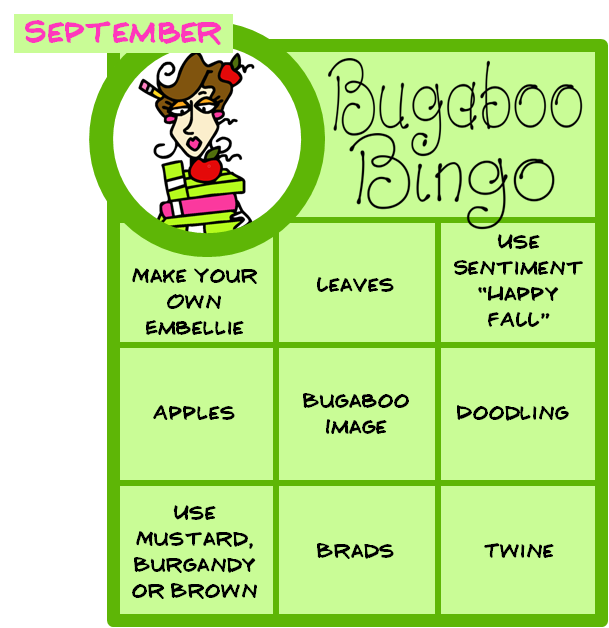 I'm entering this in Bugaboo's Catch the Bug Challenge Blog September Bingo Challenge. 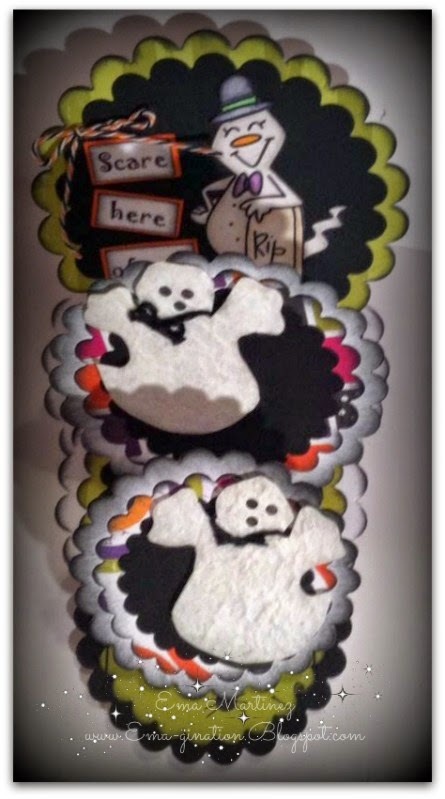 I went from top left to bottom right making my own embellishment (ghosts), Bugaboo image and twine. Hahaha....I had to laugh at your tears, I'm so sorry! Not because you had them, but because I can totally relate!!! For what it's worth, your huge efforts really paid off because this is AMAZING!! !